#Exergaming can one way to incorporate more physical activity into the day and hopefully reduce the amount of sedentary time (The irony is not lost as I'm sitting down to write this). 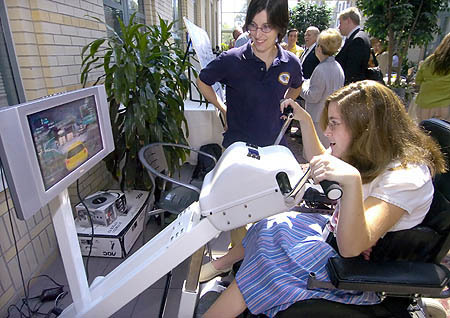 Seventeen children with Cerebral Palsy played exergames such as DDR, Wii Tennis-Bowling-Boxing and doubled their energy expenditure (above resting MET) ~ 2.22 MET. Boxing had the highest EE (3.36 MET) while DDR elicited 3.2 METs which is at the threshold of moderate intensity (MPA). Although this is not vigorous enough for cardiovascular endurance or strength training, it effectively burns twice as much as sitting down. Did the researches have them play a version of the same games while seated? Are there condition specific cut-offs for children with CP for cardiorespiratory fitness indicators? Would an exergame system like the GameCycle have been more appropriate to establish a baseline fitness level?